Create a miniature holiday tree made from fresh cut holly & boxwood to use as a holiday centerpiece or a hostess gift. Perfect for someone with a small area that could use some holiday cheer! The Workshop includes base, floral oasis, and fresh cut greens and holiday decorations. 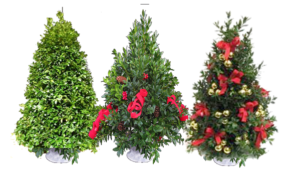 With proper care, your Holly Tree will last well into the New Year. Bring clippers, scissors and gloves for your personal use.